Section 75 regulations are part of the implementation of the much-hated 2012 Health & Social Care Act (implemented April 2013). KONP campaigned vigorously against both. We correctly argued that serious damage would be done by section 75 regulations enforcing competitive tendering of clinical services. Amidst other related dangers – including the spectre of Integrated Care Providers and the ICP contract – the damage done by s75 regulations is real and present. We say ‘Yes’ to an end to Section 75 of the Health and Social Care Act. We argue this because there is no sensible reason why campaigners, who fought to prevent this Act ever going through, would not support the scrapping of one of the most damaging sections of the act that has led to the carve-up of the NHS through multiple contracts and a competitive market. We go further and demand an end to contracting and privatisation altogether, an end to the Health Social Care Act and the reinstatement of the NHS as a wholly public service. The NHS England (NHSE) and NHS Improvement (NHSI) Committee in Common has published core proposals on primary legislation affecting contracting, privatisation and integrated care systems/providers. The legislative change proposed by NHSE is a partial recognition that the 2012 Health and Social Care Act is not fit for purpose and must be changed. And it is evident that the campaigning KONP and others have done against privatisation and ACOs, the ACO Judicial Review and associated campaign, and our testimony at the Health & Social Care Select Committee in February 2018 have all had an impact – we have forced the Government and NHSE to attempt to deny their privatisation policies, and we made toxic the term ‘accountable care’. That the regulations made under section 75 of the Health and Social Care Act 2012 should be revoked and the powers in primary legislation under which they are made should be repealed. However, NHS England is not proposing an end to contracting in the NHS – far from it. The proposed changes facilitate NHS England’s current direction of travel for the NHS, rather than representing an end to marketisation. NHSE has its own reasons for abolishing compulsory tendering and removal of the influence of the Competition and Markets Authority (CMA). While seeking to reduce the chaos of thousands of uncoordinated contracts under the Health & Social Care Act, it is pushing through fewer but massive contracts on a large scale, leading to further damage and fragmentation of the NHS. This intention is only too clear from their enforced tendering of specialised imaging services key to the cancer pathway. In Oxford the renowned NHS hospital The Churchill, recently lost control of its imaging services to the private company InHealth. This is the latest example of why we demand an end to privatisation and contracting. KONP has been campaigning against privatisation in the NHS in all its forms since 2005: against the growth of the internal market, private contracting and compulsory tendering through the Health & Social Care Act and its secondary regulations. We call for an end to privatisation, an end to contracting and the provider/commissioner split that has increased bureaucracy and delivered no benefits over almost 30 years since its introduction by Thatcher. As part of this campaign, it is logical that Keep Our NHS Public calls for the ending of Section 75’s compulsory tendering – this is part of the journey to renationalise the NHS. We continue to call for legislation to return the NHS to a publicly provided national service once again – comprehensive and universally accessible. The Secretary of State for Health and Social Care must once again be directly responsible for the NHS to Parliament and the electorate. Our overall goal is to win back Bevan’s vision of the NHS and this is encapsulated in the NHS Bill. Read about NHSE’s public engagement ending 25 April here – you and respond on a form and feedback. My gran used to tell me about her first three children that had died in the 1930’s because at the time, you had to have money to pay for a doctor. Otherwise, no matter what was wrong, children /people, would be left virtually untreated and in some cases just die. So when the NHS was created,after WW2, by the then Labour Government,they created the Welfare State, through National Insurance so that there would be medical treatment for everyone.But the Tories want to do to our NHS what they have done with all our national services ..sell them off and make you pay more .Privatisation doesnt improve services and it’s there to make profit for individuals to make money , instead of it being ploughed back into the system . Thank you Lynda – so important to share these memories with everyone borne into the NHS who may assume it was always there, and underestimate the risk of losing it. The NHS has been paid for from public funds (national insurance is one part plus funding from taxation and government revenues) and delivered to all that need it, free at the point of need – we must celebrate and retain that democratic principle. It is being eroded now – for example denying 120,000 children judged by our hostile environment to be ineligible for health care. 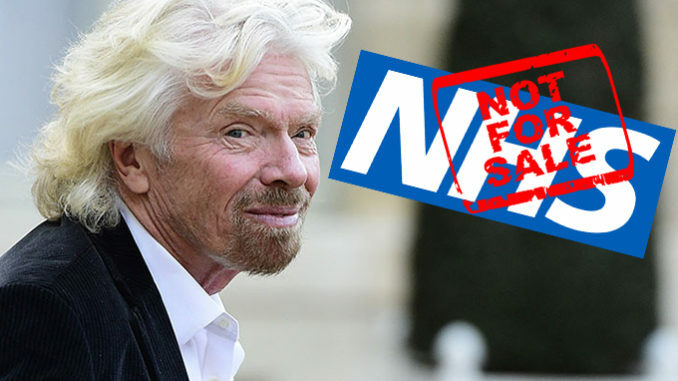 The NHS belongs to the tax payer and not for the already wealthy to make money out off. this shows their contempt for the working classes. The NHS belongs to the tax payer, not the government of the already wealthy. This shows their contempt for the working classes. The NHS belongs to the people not the already wealthy.